Plzen, Czech Republic. Great (New) Synagogue. Facade. Max Fleischer & Emmanuel Klotz, architects, 1888-93. Photo: Samuel Gruber 2018. Plzen, Czech Republic. Great (New) Synagogue. Facade, dtl. Max Fleischer & Emmanuel Klotz, architects, 1888-93. Photo: Samuel Gruber 2018. Plzen, Czech Republic. Great (New) Synagogue. Interior view to Ark. Max Fleischer & Emmanuel Klotz, architects, 1888-93. Photo: Samuel Gruber 2018. Plzen, Czech Republic. Great (New) Synagogue. Sanctuary ceiling. Max Fleischer & Emmanuel Klotz, architects, 1888-93. Photo: Samuel Gruber 2018. Last week it was announced that restoration work would soon being on the interior of the New or Great Synagogue of Plzen in the Czech Republic (You can read more about plans here). I visited the synagogue this summer, along with other sites in Plzen including the Old Synagogue and the Holocaust Memorial. Plzen, Czech Republic. Great (New) Synagogue. Max Fleischer & Emmanuel Klotz, architects, 1888-93. Photo: Samuel Gruber 2018. To say that the Great Synagogue is impressive is an understatement. The building's prominent location, size and abundance of decoration make it one of the best places to experience the community and architectural optimism of European Jewry in the late nineteenth century. What it lacks in architectural originality it makes up for in grandeur. today oday it also stands as a surrogate for so many similar synagogues destroyed between 1938 and 1945, and even - like the great synagogue of Bratislava - under subsequent Communist rule. Tragically, the growing and prosperous Jewish community of Pilsen/Plzen, which numbered about 2,000 when the synagogue opened, was only able to enjoy the building for less than fifty years before the Nazi invasion of the Czechoslovakia. Under Communism, only a few old synagogues in Prague were accessible, and the until the Velvet Revolution, the synagogues of Plzen were largely forgotten - or at least ignored. The original plan for the Great Synagogue was prepared by the well-known Jewish Viennese architect Max Fleischer (1841--1905), who had designed many other (now destroyed) synagogues and Jewish community buildings in Vienna and throughout the Hapsburg Empire. He proposed a Gothic design with twin 65-meter towers and large buttresses. The ground plan was established and the cornerstone laid in 1888, but work stopped when city councilors rejected the plan fearing the new large building would compete with the nearby St. Bartholomew Cathedral. In 1891 a revised and smaller design was prepared by Emmanuel Klotz that kept the plan, but lowered the towers and substituted a mix of Romanesque, Moorish and Renaissance forms instead of Gothic. This design introduced the enormous six-pointed star on the facade. Perhaps this was meant as a sign of defiance - announcing the clear Jewish purpose of the building. Or, it can also be seen as a warning of sorts to Christians that this building - despite it location and size - was not a church. Inside the Plzen Great Synagogue architect Klotz and whoever worked with him on the decoration threw almost everything in the style books into the decorative mix. There is a bewildering variety of historicist and imaginative motifs which sometimes compete, but surprisingly mix well enough to create an impressive interior. There was a large organ from the beginning, and one can imagine the reverberation of organ notes, the colors from the richly painted ceiling and walls flickering in gas light, and the filtered light through the stained glass windows changing with the hour, combined to create a literally awesome experience for those Jews who first walked in the doors. Much has been written about this building. In this post I only want to draw attention to the widespread use of the six-pointed Star of David in the decoration - both outside and in. For the Jewish Community of Plzen, and for their Christian neighbors, the New Synagogue was surely a "star attraction" in the city. Here are some of the many stars found in the synagogue decoration. Besides the massive star on the facade, stars are sprinkled throughout the interior stucco, painted, and carved wood decoration. Plzen, Czech Republic. Great (New) Synagogue. Stucco decoration on sanctuary gallery parapet. Photo: Samuel Gruber 2018. Plzen, Czech Republic. Great (New) Synagogue. Sanctuary ceiling decoration detail. Photo: Samuel Gruber 2018. The Jewish Star became representative of the worldwide Zionist community, and later the broader Jewish community, after it was chosen as the central symbol on a flag at the First Zionist Congress in 1897. One sees in the Plzen synagogue, however that the symbol was already widely used and had achieved a certain popularity in the proceeding decades. Theodore Herzl and the Zionists took advantage of the success of the relatively new symbol and appropriated it for their purposes. The Jewish history of the so-called Star of David is explained by Gershom Scholem in his writing about Jewish symbols and mysticism. In 1949 he wrote in his popular essay "The Curious History of the six-Pointed Star" (Commentary, 8 1949, p. 251): "Then the Zionists came, seeking to restore the ancient glories—or more correctly, to change the face of their people. When they chose it as a symbol for Zionism at the Basel Congress of 1897, the Shield of David was possessed of two virtues that met the requirements of men in quest of a symbol: on the one hand, its wide diffusion during the previous century—its appearance on every new synagogue, on the stationery of many charitable organizations, etc.—had made it known to everybody; and on the other, it was not explicitly identified with a religious association in the consciousness of their contemporaries. This lack became its virtue. The symbol did not arouse memories of the past: it could be filled with hope for the future." From 1897 on the symbol was used by Zionists, but it also continued to be used ever more widely by Jewish communities, organizations, and individuals of all ideologies. Plzen, Czech Republic. Great (New) Synagogue. Women's gallery ceiling decoration detail. Photo: Samuel Gruber 2018. Plzen, Czech Republic. Great (New) Synagogue. Ceiling decoration near stairway vestibule. Photo: Samuel Gruber 2018. The Great Synagogue was used for worship until the Nazi occupation of Plzen, when it became a storage facility during the war - and thus escaped destruction. It was returned to the small community of Jewish survivors after the war but fully closed in 1973 when the Communist regime allowed it to fall into disrepair. Restoration took place 1995–98, when the building was stabilized and basic repairs were undertaken,and it reopened in 1998. The community now uses the former winter prayer room - a much smaller space - and the main sanctuary is used for concerts and exhibits. I do not know if the new restoration plans call for a total restoration of the original interior decoration, or whether the objective is better conservation - an approach that will protect the original material but maintain the look of damage as a reminder of the sad history of the building and its former congregation. Plzen, Czech Republic. Great (New) Synagogue. Door to rear women's gallery. Photo: Samuel Gruber 2018. Paris, France. 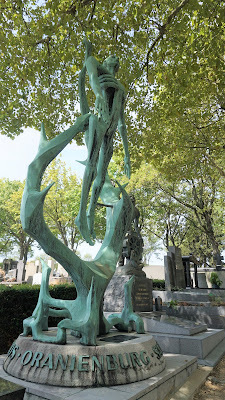 Père-Lachaise Cemetery. Mauthausen Memorial. Gérard Choain, sculptor (1958). Photo: Samuel Gruber 2018. A a recent visit to Paris I spent much of the day at the enormous Père Lachaise Cemetery, which besides begin a 44-hectare cemetery is also one of Europe's great outdoor sculpture museums. The list of famous people buried there is very long, but I was most interested in seeing monuments erected in the past 70 years commemorating victims of various Nazi concentration and death camps. These monuments, which now number more than a dozen, have been erected by camp survivors, political organizations, and other other associations beginning in 1949, when memorials to victims of Auschwitz-Birkenau (June) an the camp at Neuengamme (November) were dedicated. Since then additional monuments to victims of the camps at Ravensbrück (1955), Mauthausen (1958), Buchenwald-Dora (1964), Oranienburg-Sachsenhausen (1970) Dachau (1985), Flossenbürg (1988), Buna-Monowitz Auschwitz III (1993), Bergen-Belsen (1994), Natzweiler-Struthof (2004) have been erected. 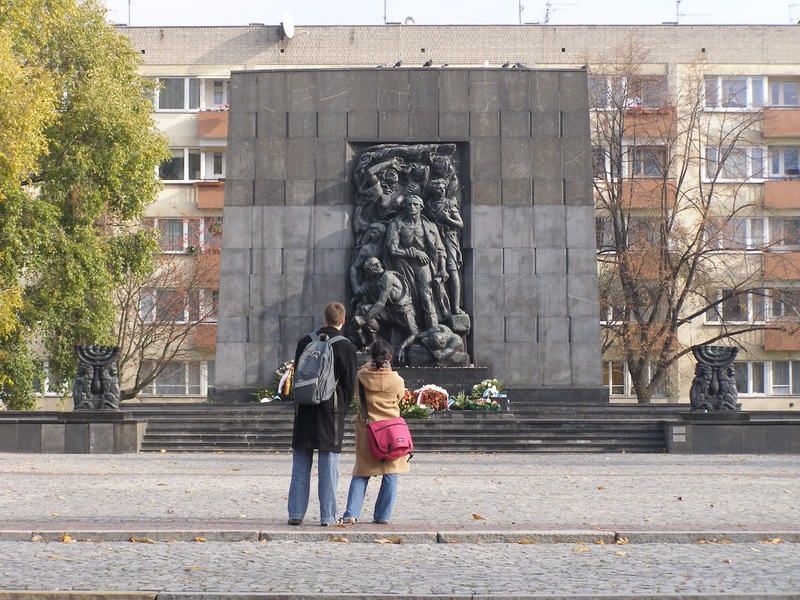 In addtion there is a monument (2006) to the deportees of Convoy 73 which took Jews from Drancy to the Ninth Fort in Kaunas, Lithuania. I was especially interested in the 1958 Mauthausen (also referred to as Mauthausen-Gusen) memorial, which I include in my class. This memorial is of note for many reasons. It is if high artistic merit, but also its location, materials, explicit narrative, and inscriptions all have meaning in relation to the rest of the cemetery, the history of art, and specific acts of Nazi cruelty. As of August 2018, I found the monument, which was created by sculptor Gérard Choain (1906-19880, in restoration. Choain himself was a wounded veteran and was a prisoner of war in German camps from 1939 to 1945. After the war he created several memorial sculptures. Formally, the monument is designed for its context in the Père Lachaise cemetery. It is located near an a corner in section 97, and its tall granite architecture stands above many of the nearby tombs. At first, the form of the granite appears similar to an obelisk or tower, which are frequent motifs employed throughout the cemetery, against which a stone or bronze allegorical figure are often placed. A good example is the towering granite tomb of Jacques Léon Clément-Thomas and Claude Lecomte (1875) created by architect Georges-Ernest Coquart and sculptor Louis-Leon Cugnot. This monument, like many others in the cemetery, presents a triumphant interpretation of death and entombment. Paris, France. Père-Lachaise Cemetery. Tomb of Jacques Léon Clément-Thomas and Claude Lecomte, 1875. Photo: Samuel Gruber 2018. Unlike the Clemont-Thomas-Lecomte monument, which boasts a large allegorical figure of an armored woman with sword and wreath, the Mauthausen monument is not triumphantly allegorical, but instead its architecture and sculpture are two important parts constituting a unified fact-inspired narrative. The stone setting is no mere backdrop, but is intended as an active element in the memorial's story-telling. The steep-stepped granite tower represents the infamous Stairs of Death at the Mauthausen granite quarry where prisoners were forced to climb carrying granite blocks weighing 25 kilos and more, and where they often plummeted to their deaths. The very material has meaning - the granite for the monument was brought from the quarry and stands like a holy relic, a witness to suffering (compare with the Warsaw uprising Monument where the granite for the giant stele has originally be quarried for a Nazi monument that was never built). Empowering inert material has its roots in ancient religions, but also is common in Christian practice, where the very stones where Jesus is said to have trod, or the column to which he was bound, or the parts of cells or pieces of torture instruments of martyrs have been treasured. More broadly, any item that had contact with a saint either living or dead, can assume some aspect of that saint's holiness; thus the cult of relics. In the commemoration of the victims of Nazism and especially of the Holocaust, this power of authenticity will continue to hold sway in later memorials and museums when in the 1940s and 1950s earth and ashes were brought from crematoria to help sanctify new memorial sites. Later, in the 1980s until today, Holocaust museums strive to acquire original boxcars and other now-iconic Holocaust items. A recent twist on this is the casting in bronze of "real" objects as simulacra for commemorative purpose. Paris, France. Père-Lachaise Cemetery. Mauthausen Memorial, detail. Gérard Choain, sculptor (1958). Photo: Samuel Gruber 2018. The bronze figure of an emaciated prisoner sculpted by Gérard Choain attempts carries a heavy stone to the top of the 186 Stairs of Death. While this explicitly recalls the life and death daily struggle of prisoners who worked in the quarry, Choain's figure also has a distinguished artistic pedigree. Any Frenchman immediately sees the resemblance to Auguste Rodin's great statue of The Shade (also known as The Slave) of 1886. This was the figure used in triplicate atop Rodin's massive Gates of Hell, which in many other contexts has greatly influenced the imagery of Holocaust suffering and death (including most obviously the central sculpture of the Miami Holocaust Memorial). 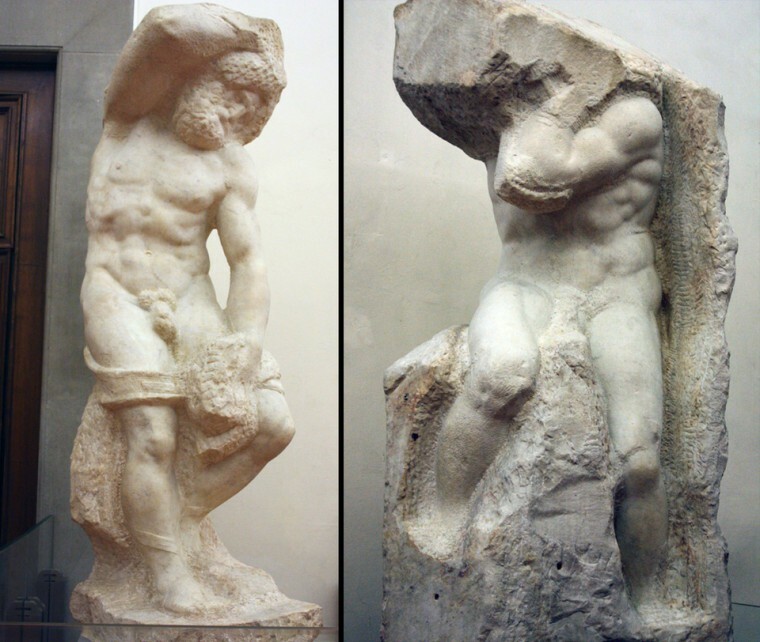 There is also a close connection to Michelangelo's unfinished slaves (also known as The Prisoners) intended for the Tomb of Pope Julius II, and since 1909 on view at the Galleria dell'Accademia in Florence. Auguste Rodin, The Shade (or the Slave), 1881-1886. Bronze. 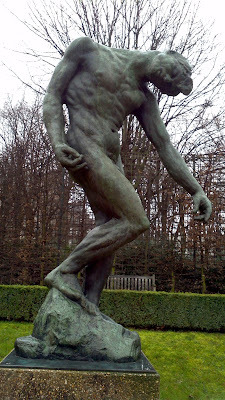 Musée Rodin, Paris. Photo: Samuel Gruber 2013. Michelangelo. Slaves or Prisoners (unfinished works originally intended tomb of Julius II). Galleria dell'Accademia, Florence. staircase while under the blows of the SS. This monument perpetuates their memory and their struggle for French independence. The detailed inscription is indicative that the moments was meant to be both a witness and a warning. The specificity is refreshing after the bland banalities inscribed on so many official monuments of later decades. Most of the inmates and victims at Mauthausen were not Jewish and this is not a Holocaust Monument per se. 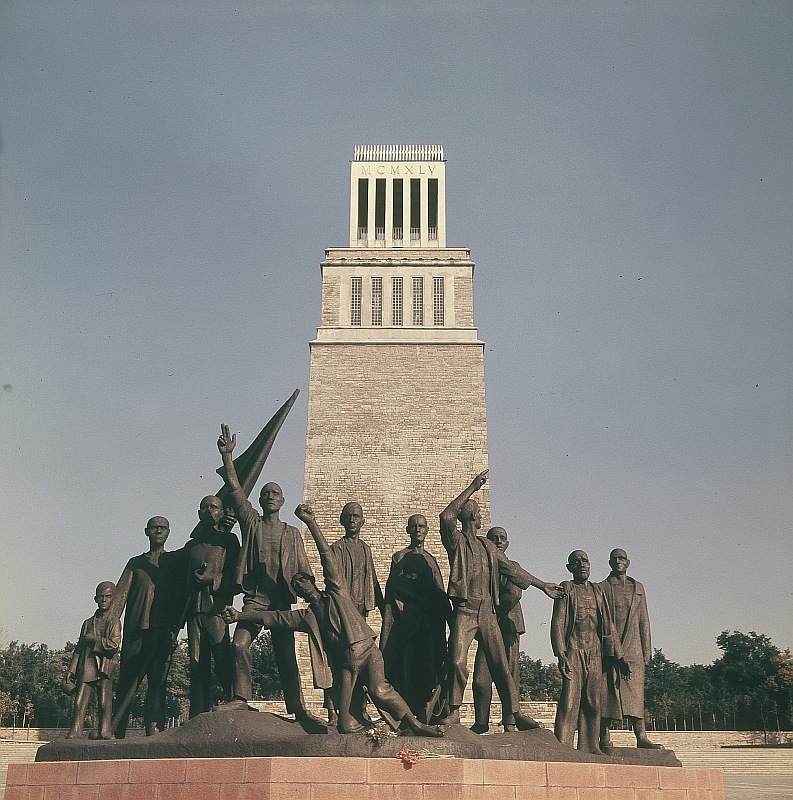 Still, the memorial plays an important role in the development of Holocaust monuments and iconography. It is one of a group of works in the late 1950s that focuses on the physical - even cadaverous - state of Holocaust victims, rather than idealizing them as healthy heroes and fighters. Compare, for example, this monument to the better known Warsaw Ghetto Uprising Monument by Natan Rappoport (1948) and the great Socialist Heroes monument at Buchenwald by Fritz Cremer, dedicated, like the Mauthausen Monument, in 1958. Warsaw, Poland. Ghetto Uprising Monument. Natan Rapoport, sculptor, 1948. Photo: Samuel Gruber 2008. 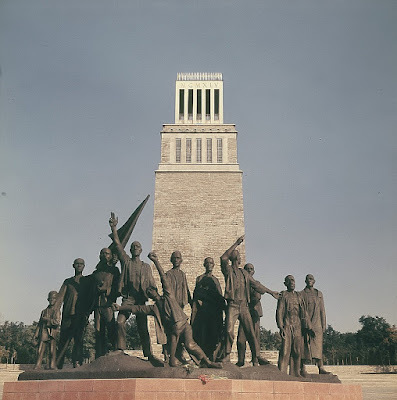 Buchenwald, Germany., "Revolt of the Prisoners" (Revolte der Gefangenen), Fritz Cremer, sculptor, 1958. Photo: Richard Peter/Deutsche Fotothek. According to the U.S, Holocaust Memorial Museum, inmates and victims at Mauthausen included more than 37,000 non-Jewish Poles,, nearly 23,000 Soviet civilians, between 6,200 and 8,650 Yugoslav civilians, approximately 6,300 Italians after September 1943at least 4,000 Czechs and in 1944, 47 Allied military personnel (39 Dutchmen, 7 British soldiers and 1 US soldier), all of them agents of the British Secret Operations Executive. In addition to French Resistance fighters thousands of Spanish Republicans were also brought to Mauthausen. About 29,000 Jews are believed to have been held at Mauthausen, mostly in the latter years of the war. The Mauthausen site was one of the first to be memorialized after World War II, a subsequently became the site for dozens of monuments. 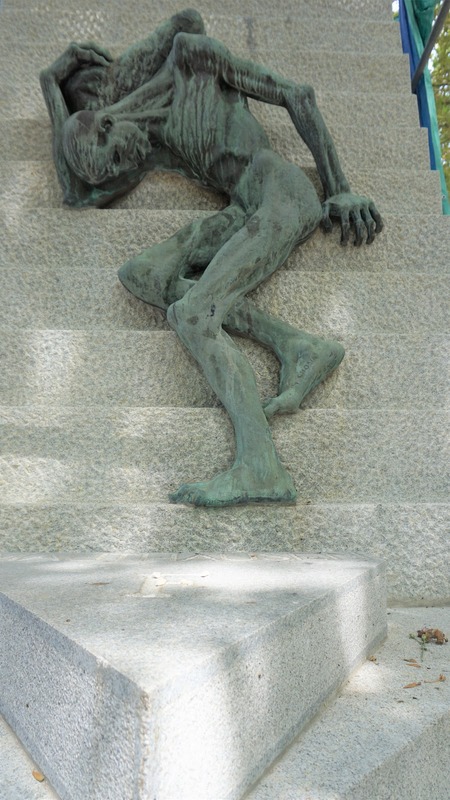 Ashes and relics from Mauthausen were also incorporated in many other monuments in other locations, such as the extreme modernist Monumento in onore dei caduti nei campi di sterminio nazisti located outside Cimitero Monumentale di Milano. The glass and metal cube was designed by the architectural firm BBPR (Lodovico Barbiano di Belgiojoso, Enrico Peressutti, Ernesto Nathan Rogers), one of whose founders, Gianluigi Banfi, was killed at Mauthausen. Earth from the site was encased at the heart of the monument to represent all of the camps in which Italians died (on this see: Jean-Marc Dreyfus, "The Transfer of ashes after the Holocaust in Europe, 1945-60," in Human Remains and Violence, I:2 (2015), p 23). In France, the amalgamation of Resistance fighters, Jewish deportees, and other victims of Nazi crimes was in keeping with the themes of the Gaullist politics of memory of the 1950s, and also the general stance of the official Jewish Community, which beginning in the 1940s placed plaques in synagogues remembering Jewish victims under the heading "Morts pour la France," (Fallen for France), even though many victims died through the complicity of French authorities and police. This generalization of national victim-hood would not begin to change until the 1970s, when films like The Sorrow and the Pity drew public attention to the widespread collaboration of the French Vichy government with the Nazi regime, and also the gradual recognition of the complicity of the French police in the round-up of Jews for deportation, especially in the event that has come to be known as the Vel d'HIV Roundup of July 16-17, 1942. Only in the 1990s were the special circumstances of the deportation and murder of Jews of France (native and resident refugees) fully acknowledged by President Chirac, and a new monument was dedicated in 1994 (about which I've written in the past). Also, beginning in 2002 many new notices about the deportation of Jewish children have also been posted around the city. I'll post some more thoughts about some of the other memorials at Père Lachaise Cemetery in future posts, but here a few views of other monuments that build on the image of suffering presented on the Mauthausen Monument. In these subsequent memorials the figures are increasing contorted, emaciated, and cadaverous. There is a move away from the classical and heroic artistic language to one that is more fragmented, expressionist and abstract, influenced as much by the work of Picasso (Guernica), Lipchitz and Giacometti more than the tradition of Michelangelo, Delacroix, and Rodin. Paris, France. Père-Lachaise Cemetery. Natzweiler-Struthof Memorial (2004). The bronze figure is a replica of the figure by Georges Halbout installed at the entrance of the Strurthof camp. Photo: Samuel Gruber 2018.